Wow! 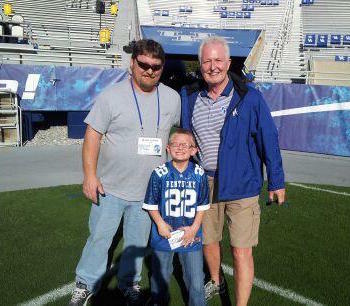 Hunter’s dream was to help UK Men’s Football coach, Joker Phillips, during a UK game. Not only did Hunter get to assist Coach Phillips, but he joined the team for pregame meetings, stayed in the same hotel as the team, dined with the team for dinner the night before, rode on the team bus to the stadium, led the Cat Walk with Coach Phillips, received the game ball, AND sat alongside Coach Phillips for the post-game press conference. Whew! Hunter had a fantastic time, and the smiles just kept coming!